"An Ideal Industrial Locomotive: No Smoke, No Steam, No Coal"
which replaces the cumbersome coal-tender. The new industrial oil-fired steam locomotive in cross-sectional view. Each part is plainly illustrated, showing the compact construction of this coal-saving iron horse. 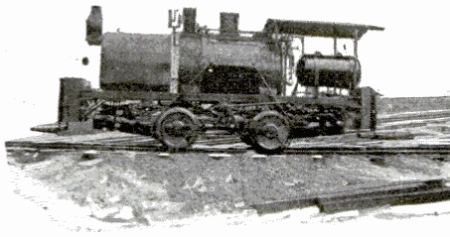 This information was transcribed from the article entitled "An Ideal Industrial Locomotive: No Smoke, No Steam, No Coal" that appeared on page 851 of the June, 1910 issue of Popular Science Monthly. The top image's caption incorrectly states the "oil tank" is located in front of the boiler. As the bottom image correctly notes, the water tank is located in front of the boiler with the "fuel tank" being located inside the cab behind the boiler. The title and text of the article notes the locomotive does not create smoke during operation. Although we can't conclusively say "no smoke" was created in operation, it seems very probable that smoke would be produced when using oil, especially crude oil. When kerosene was used for fuel, minimal or no smoke would have been produced. The title incorrectly notes "No Steam". The foundation of any steam locomotive, Bell locomotives included, is the production and utilization of steam for propulsion.